This was a foggy and rainy morning. 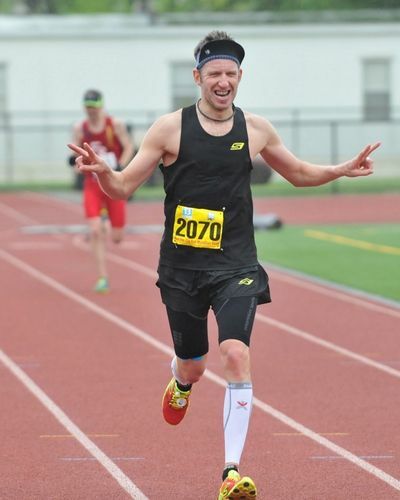 Did second leg of Poconos Marathon relay. Morning did not start well, forgot my GPS at home and shoes I was going to bring to Reno....Due to so,me road work the organizers had to change the course totally. On the elevation map it look similar but last legs was something different this year. The start was located at Poconos raceway, huge place. Unfortunately the organizers was not prepared, no answers given were to go etc...... We could also use the Raceways bathrooms, could have been good if they had opened up more of them. Meg was going to the first down hillier part of the Marathon. From the start we took a bus to the relay change. Me and Reno did an easy 2 mile warm up going out the course. The first mile was straight up, really tough start it seems like. Meg had hopes of doing close to 1.30. She came in around 1.33 and place 4th in the coed relay. First team came in around 1.28, so I had 5 min up to the leader. The climbing started immediately. I felt good climbing and paced myself well. I had no intentions to try to follow Reno. After the long first hill the hills just continued. Mile 16-20 was slightly down hill, but you could barley notice it. On the elevation map it looks like its mostly downhill but all those nagging rolling hills tear up you legs. At mile 22 I was really tired but at one of the few flat sections I pushed a bit to try to wake up legs and it worked. The last 3 miles I decided to try to push harder and I was able to pick up some pace. Felt really good. Over all a good race but really tough. My time was 1.24+, second fastest time on the second leg. Our team finished secon of the coed, fourth over all. Total time was 2.58.33. Satisfied how I ended the race hard and strong on a very difficult course. Reno Stirrat said after the race, that this was the toughest half marathon course he had ever done. Reno knows what he is talking about with more then 40 years of experience!....Of course the Skechers GoRun Speed preformed well, this was the first time I tried them on really wet surface. Excellent grip!